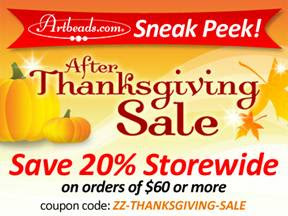 Artbeads is having a Sneak Peek ‘After Thanksgiving Day Sale’ coupon you can use right now and will save you 20% off orders $60 or more. This is your chance to get a jump start on great savings before your favorite items sell out. The coupon expires on Sunday, November 28, 2010 at 11:59pm PT. Use Coupon Code: ZZ-THANKSGIVING-SALE at checkout.